Like many of us, Joe Romeiro was afraid of sharks after watching Jaws. But that fear turned into curiosity when he and his grandfather caught a shark on one of their many childhood fishing trips. That was a good thing for his chosen profession: filming sharks. He had a part in several shows on this year’s Shark Week on the Discovery Channel, including “Shark-Croc Showdown” and “Shark Vortex.” Shooting footage of sharks for more than a decade has allowed Romeiro respect instead of fear the animal. Shark populations are declining, and many experts believe ignorance caused by fear fuels unawareness of this problem. “What it really comes down to is that this animal needs to be protected, needs to be looked at and needs to be understood at little bit better,” Romeiro says. Here are four interactions he has had with sharks that have proven them to be gentle giants, rather than loathsome predators. About six years ago, Romeiro was filming blue sharks in Rhode Island when one shark—it’s body ridden with leaders, hooks and lines—stopped swimming near him. After a while, Romeiro swam to the shark and removed a leader. Then the shark swam by him again, and Romeiro took out a hook. Although there were eight other people in the water, the shark kept coming to Romeiro until it hovered in front of him. “I actually felt like this animal knew that I was trying to help it and was allowing me to,” he says. 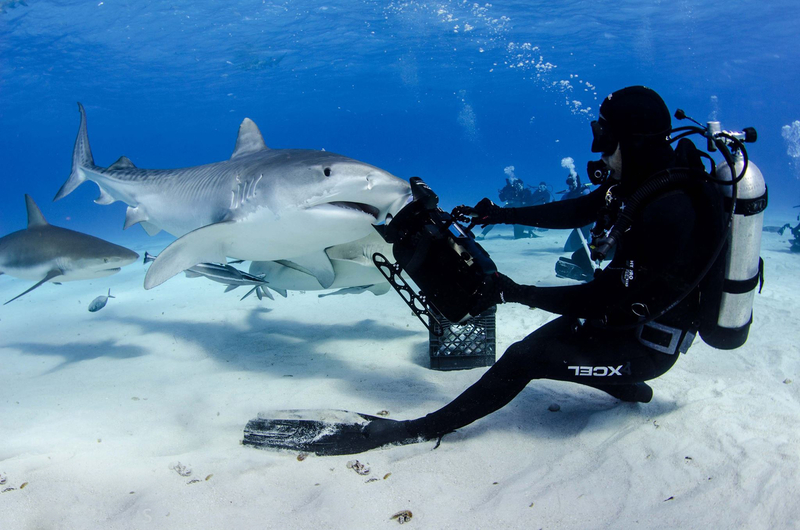 Tiger sharks, which can weigh roughly a thousand pounds and grow to around 12 feet, roam underwater at Tiger Beach in the Bahamas. Because of their size and habit of scavenging for their food, they have earned a reputation for eating anything. That’s why Romeiro was surprised to see the sharks carefully swimming to avoid hitting him with their tails during one of his first dives in that area. Romeiro first met Emma the tiger shark ten years ago. The water was murky that day, making it difficult to see. But that didn’t stop Emma from charging through the water, going right up to Romeiro and staring at him.